The National Endowment for the Humanities (NEH) has awarded Carnegie Mellon University's Andreea Deciu Ritivoi a research fellowship to explore how the concept of "captive nations" emerged in early Cold War political discourse, and how their liberation only appeared as an American responsibility. Ritivoi's project, "Captive Nations: American Democracy in the Cold War and the Politics of Rescue," will begin in January 2015. The current cycle of NEH funding supports a wide range of projects, including research fellowships and awards for faculty, traveling exhibitions, the preservation of humanities collections at smaller institutions, and training programs to prepare libraries, museums and archives to preserve and enhance access to their collections. "NEH grants play a critical role in making the insights afforded by the humanities available to all to help us better understand ourselves, our culture, our society," said NEH Chairman William Adams. Ritivoi, a professor of English in CMU's Dietrich College of Humanities and Social Sciences, will use the award to research the way American political actors engaged with Central and East European refugees to uncover how the notion of captive nations came to be widely accepted. Understanding its origins will shed light on how the politics of rescue — through aid and warfare — became more than just a U.S. political agenda, but a strategy that involved a trans-national political network of exiles, migrants, governments, media and the intelligentsia. Ritivoi hopes to recreate the network in order to examine how historical conditions and patterns of language emerge and lead to long-term political effects. "I am delighted that the NEH has awarded Professor Ritivoi a highly competitive fellowship for her scholarship on the Cold War and its continuing political legacy," said Chris Neuwirth, head of the Department of English. "Professor Ritivoi's tracing of a political vocabulary that is still operating and influencing international relationships and the role of Western democracies in global politics today will make a significant contribution to Carnegie Mellon's mission of bringing humanistic perspectives to our understanding of cultures and societies." Created in 1965 as an independent federal agency, the NEH supports research and learning in history, literature, philosophy, and other areas of the humanities by funding selected, peer-reviewed proposals from around the nation. 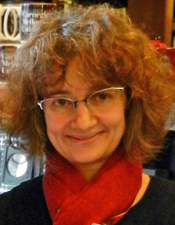 For more information on Ritivoi, visit http://www.cmu.edu/hss/english/people/faculty/bios/andreea-deciu-ritivoi.html.